Welcome to the Mesa Verde National Park Information Page. Mesa Verde National Park is located in the high plateau country of southwestern Colorado. The Park is located in the southwest corner of Colorado, about 10 miles east of Cortez, Colorado and about 36 miles west of Durango, Colorado. The park entrance is midway between Cortez and Mancos, just off of US Highway 160. It is a 21 mile drive from the park entrance to park headquarters and the Chapin Mesa archeological sites. Morefield Campground is 4 miles from the entrance, and Far View Visitor Center is 15 miles from the park entrance. The closest international airport is Denver, Colorado and there are smaller airports in Cortez, Durango, Pueblo or Colorado Springs. 1. Take Highway 50 South to Highway 550 South to Highway 160 West to the park. 2. Take I-25 South to Highway 160 West to the park. 1. Take I-70 West to Highway 24 West to I-25 South to Highway 160 West to the park. 2. Take I-80 West to I-76 West to Denver then take I-25 South to Highway 160 West to the park. 1. Take I-25 North to Highway 160 West to the park. 1. Take I-80 or I-84 to I-15 South to Utah Highway 6 South to I-70 East to Highway 50 South to Highway 550 South to Highway 160 West to the park. 2. Take I-40 East to Highway 666 North to Highway 160 East to the park. Mesa Verde National Park is located in the Four Corners Area, which has one of the highest concentrations of archeological sites in the United States and borders the Ute Mountain Ute Indian Reservation. Mesa Verde National Park was established by Congress on 29 June 1906. It was the first cultural park set aside in the National Park System. 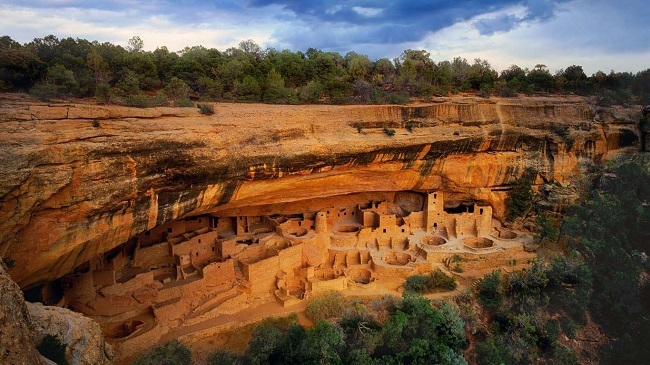 Mesa Verde National Park was also designated as a World Cultural Heritage Site on September 8, 1978 by UNESCO, an United Nations organization formed to preserve and protect both the cultural and natural heritage of designated international sites. These pre-Columbian cliff dwellings and other works of early people are the most notable and best preserved in the United States. There is limited access in the winter with the peak visitation in July and has over 600,000 visitors per year. Mesa Verde National Park preserves a spectacular reminder of the 1,000 year culture of the Ancestral Puebloans. Archeologists have called this people Anasazi, from the Navaho word that means “ancient”. They are now called Ancestral Puebloans, reflecting their modern descendants. The first Ancestral Puebloans settled in Mesa Verde(Spanish for “green table”) about AD 550. They are know as Basketmakers because of their impressive skill at that craft. Formally a nomadic people, they were now beginning to lead a more settled way of life. Farming replaced hunting-and-gathering as their main source of livelihood. They lived in pithouses clustered in small villages, which they usually built on the mesa tops, but occasionally in the cliff recesses. They soon learned how to make pottery and they acquired the bow and arrow, a more efficient weapon for hunting than the atlati (spear thrower). The pithouse represents the beginning of a settled way of life based on agriculture. Its basic features were a living room, squarish in shape and sunk down a few feet into the ground, four main timbers at the corners to support the roof, a fire pit with an air deflector, an antechamber, which might contain storage bins or pits, and a sipapu. Pithouses evolved into kivas of later times. In Mesa Verde, the people lived in this type of dwelling from about 550 to 750. Bicycle riders must comply with all traffic regulations. Bicycles may be ridden only on established public roads and parking areas. Each bicycle must exhibit a white light on the front visible for 500 feet and a red light or red reflector on the rear visible for 50 feet or 300 feet during periods of low visibility and in the tunnel. Bicycles must be ridden as far to the right of the roadway as possible. At no time may a bicycle rider be attached to or towed by a motor vehicle. Bicycles are not allowed on the Wetherill Mesa road or on any trails. Due to the steep nature of the road, lack of shoulders and poor conditions of the pavement, organized bicycle groups are prohibited. There is one campground, Morefield Campground, in Mesa Verde National Park. It is located 4 miles from the park entrance. There is no backcountry camping. Ranger-Guided Tour Fee – $2.00 – One Time fee per person per ranger-guided tour of either Cliff Palace or Balcony House and Long House. Note that there are also free ranger-guided tours of other sites available. Lodging is available at Far View Lodge, which is closed in winter. Reservations can be made by contacting the Mese Verde Co., PO Box 227, Mancos, CO 81328. Pets must be physically restrained at all timess; animals are not allowed in public buildings or on trails. Rangers / Naturalists lead tours of the different ruins and cultural areas of the Park. Summer high’s reach the 90’s with evening temperatures to the mid-60’s. Thundershowers are possible. In fall and spring, daytime temperatures are in the 30’s. Winter temperatures range from the 40’s down to the teens. There is an average of 80 to 100 inches of snowfall.